There are many different attractions that are sure to make their way to your itinerary when planning your Santa Fe vacation. From authentic Southwestern restaurants to Indian markets to art galleries, there is much to discover. And we want you to experience as much as you can during your stay at Four Kachinas! One of the best entertainment venues to put on your list is the Lensic Performing Arts Center. This famous movie theater and vaudeville house is home to film, music, opera, spoken word, and more artistic endeavors. Discover the authentic local arts scene during your vacation stay by visiting the Lensic Performing Arts Center! Find out more about all of the great attractions and entertainment venues near Four Kachinas when you download our free Vacation Guide. It’s full of the best recommendations for places to enjoy the local arts and entertainment scene, such as the Lensic Performing Arts Center. If you’re looking for a performance in Santa Fe to attend during your stay, then consider going to a show at the Lensic Performing Arts Center. This great community staple in Santa Fe features over 200 artistic events each year, with a focus on dance, music, film, and theater. This is the perfect place to go for a date night during your getaway at Four Kachinas! Part of the Lensic Performing Arts Center’s mission is to support the arts in the Santa Fe community. Therefore, the center has a lot of local partners that have consistent shows and events throughout the year. Home to many stellar performing arts groups, The Lensic gives a diverse look into the local arts scene that you will love! Partners include Aspen Santa Fe Ballet, the Santa Fe Opera, and the Santa Fe Chamber Music Festival, among others. Along with its current endeavors to connect the community, the Lensic Performing Arts Center has a rich history as a place of entertainment. Built in 1931, The Lensic was a happening vaudeville venue, where the community collected to see actors, dancers, singers, and comedians. It was a stunning center for live performance until it fell into disrepair in the late 1990s. Its unique architecture was the gem that inspired a renovation and refurbishing of the theater in the 2000s, allowing its beautiful facade to live on for generations to come. Its 800 seats were open once again shortly after renovations, allowing its purpose to continue on for more to enjoy! 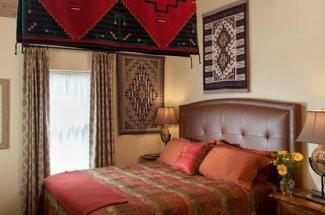 By staying at Four Kachinas during your Santa Fe getaway, you will be engaging in a rich and authentic culture that runs deep within this city. Our bed and breakfast provides a complimentary buffet breakfast each morning as well as Southwestern decorations throughout our accommodations. Our Chimayo Room’s Spanish Colonial decor is a guest favorite, from the ample windows and soft colors to the rich textiles creating a warm, inviting haven. Enjoy the Spanish Colonial art and furniture, as well as a private stairway and entrance into the central courtyard. 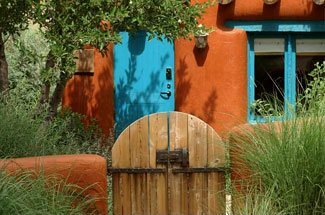 Plan your Santa Fe getaway today, and embrace the local culture during your memorable visit!